GM Francisco Vallejo Pons: "I Am the Kind of a Guy Who Just Likes a Little Bit of Everything"
M.BOYARD: This is Chess-News, and today our guest is GM Vallejo Francisco from Spain. Unfortunately, you are not very happy with your game today, which ended in a draw? F.VALLEJO: Yes, I made a draw and well, I've had a very pleasant position from the very beginning - with two bishops.. At some point I had different options to choose from. I picked one, that I thought would lead into a better position for me, but I forgot one obvious move, after which the position is still slightly better for me, but it was surely not enough to win the game. So yeah, I'm a little bit disappointed, but okay, it does not matter so much. M.BOYARD: But it's still not over for you, since there are two more rounds left, no? M.BOYARD: Last year your main goal at the EICC was to qualify and, as you said, this year is all about playing it for pleasure. How do you prefer to play? F.VALLEJO: It's easier to play when you're relaxed, I guess. But, I don't know, I played a good tournament last year and made a good result actually, so I'm happy with it. As for this year, well... Lately, I've been trying to simply enjoy the games. Probably, at some point I just realized that I will never become a World Champion, it's very unlikely, and after this life got easier and I can finally enjoy it fully. I don't know, at some point I maybe took it all too serious and... I think I can play now on pretty much the same level without taking it so serious. And probably my life will now last a little bit longer (laughs). It was a good decision. Now I just play, enjoy, and do a lot of other stuff apart from chess. Lately, I haven't been playing very much - I did not have any tournament since October, just a few games at team competitions, but no tournaments with 11 games like here. I feel a little tired actually, but then came the rest day, and we've had a good time. 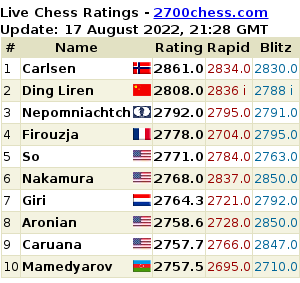 F.VALLEJO: Well no, not that great, but I'm not bad for a chessplayer. M.BOYARD: How do you like to spend your free time, apart from playing football and chess? M.BOYARD: A question for me- what series do you like to watch? F.VALLEJO: Well, I've seen a few lately... My favorite ones are Dexter, for example, or Breaking Bad, or 24 with Jack Bauer, a typical American series. It's fun! But the problem is that I cannot watch series per episodes, I'm not patient enough to wait for a new one to come week after week. So I need the series to be over, so I can watch is at once. M.BOYARD: Thank you and good luck for the rest of the tournament and enjoy your free time! Veselin Тopalov: "Important Is That I Don't Spend a Lot of Time Far From Home Just In Vain"
Е.SUROV: It is 14:00 MSK Time and our guest online from Beijing is Veselin Topalov. Hello Veselin! Е.SUROV: I didn't really think I would have to congratulate you right after the end of this competition but it turned out you won the Grand Prix Series. That's great, isn't it? Shakhriyar Mamedyarov: "I Had a Good Time and a Good Tournament"
М.YURENOK: Shakriyar, congratulations on your successful performance. What has happened in today's game? Alexei Shirov: "Should I Continue Playing Chess?" N.MONIN: Dear friends, this is Chess-News, I'm Nikolai Monin and a famous GM and organizer Alexei Shirov is with me. We're sitting here in a cafe and I actually have only this question: what do you think of a city and the tournament? Well, how's it going for you? E.SUROV: It's November 2nd, 15:21 Moscow time. Chess-News is on the air with Dmitry Andreikin who has just won the Grand Prix stage in Tashkent. Greetings Dmitry. Congratulations! E.SUROV: The last game of the tournament has just finished a few minites ago. How do you feel at the moment? Magnus Carlsen shared impressions on the Candidates' after six rounds. 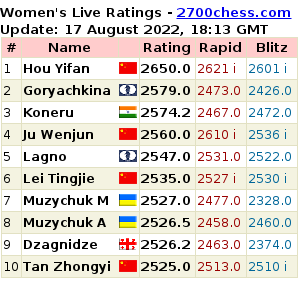 GM Veselin Topalov: "It's Premature to Talk About Fighting for the World Champion Title"
Е.SUROV: Here’s a surprise for you, ladies and gentlemen! Veselin Topalov joins us live from Zug. Veselin, hello! Е.SUROV: How long was the closing ceremony? V. TOPALOV: It lasted for about half an hour and was just typical, normal. E.SUROV: Was there anything interesting, let’s say special? Peter Leko: "Look at the Board Better Than at the Computer Evaluation"
E.KLIMETS: This is Chess-News, we are at the Governor’s Cup and Peter Leko is with us. He just finished his last round and to all appearances he is on the third place, aren’t you Peter? P.LEKO: Perhaps, I don’t know. Le Quang Liem: "It Is the Biggest Success In My Life"